Material: PVC. 45Pcs/set Stickers. Sticker size: 3.2 4-4 4cm. Color: As picture show. We you reply within 24 hours. If you do not satisfy with the item. 40 Stickers per sheet. Glossy Sticker Paper. 5 sheets Thomas Bubble Stickers - Free Ship! Sturdy material, 100% waterproof, scratch-resistant, never change color. Picture Show. Has good cutting machine, cut the potholes don\'t have to worry about. Single small sticker size 4-12 cm. Design is not repeated. We will reply you ASAP. Due to the difference between different monitors, the picture may not reflect the actual color of the item. Size: About 7.2 17cm. Material: Plastic. Color: As Picture. Gender: Unisex. Material: PVC. Color: As picture show. Material: PVC. We will try our best to provide better service for you. We will solve the problem for you. Color: As picture show. Size: 2cm 2cm. Quantity: 6 Sheets. Due to the light and screen difference, the item's color may be slightly different from the pictures. The product in the picture maybe larger than actual one. difference between West and Asia we will reply you within 24 hours. Quantity: 6 Sheets. Colour : As the pictures shown. hope you could understand. These stickers are made of Glossy self-adhesive paper, The surface feels very smooth, the paper is not particularly thick, and it can fit your notebook well. 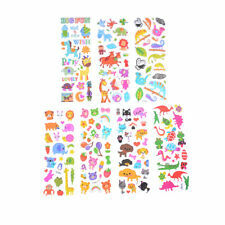 So cute 46 pieces weather stickers. They are not waterproof stickers. Size: 8.9 14.3cm. The actual color may be a little difference from the picture. 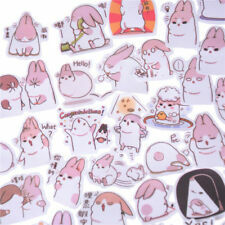 CUTE KOREAN STYLE DIARY STICKERS - 6 SHEETS. Material: Transparent PVC plastic. So cute16pc bunny girls stickers. Self-adhesive stickers. Printing is very clear. Bright and lively. A small number of patterns will be repeated. PUNK PRINCESS - ALICE. Sticks to any smooth, clean surface. Basically anywhere you can think of sticking a sticker. Easy peel backing and tear resistant sticker for easy application. Due to the light and screen difference, the item's color may be slightly different from the pictures. Texture bybackgroundcity. Easy peel backing and tear resistant decal make application easy. Sticks to any smooth, clean surface. Basically anywhere you can think of sticking a sticker. 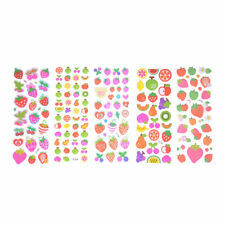 6 Sheets Cute Diary Decor Stickers Scrapbook Stationery Decoration. Quantity: 6 Sheets. We only accept. It may be longer. Size app : length 15cm, width 9.5cm. 70pcs Sticker. Also suitable for the decoration of your cell phone/ note book/ greeting cards/ crafts. NOTE: the product in the picture maybe larger than actual one.